Welcome to the February 2018 edition and 53rd issue of our monthly newsletter! Thank you for visiting, we hope you enjoy this jam-packed issue. We are quickly approaching that time of year where people are already preparing their grilling set-ups for the encroaching warmer months; cleaning and servicing their grills, renovating their backyards, and so on. With that in mind, we have quite a few features lined up for this edition which we’ll break down below. 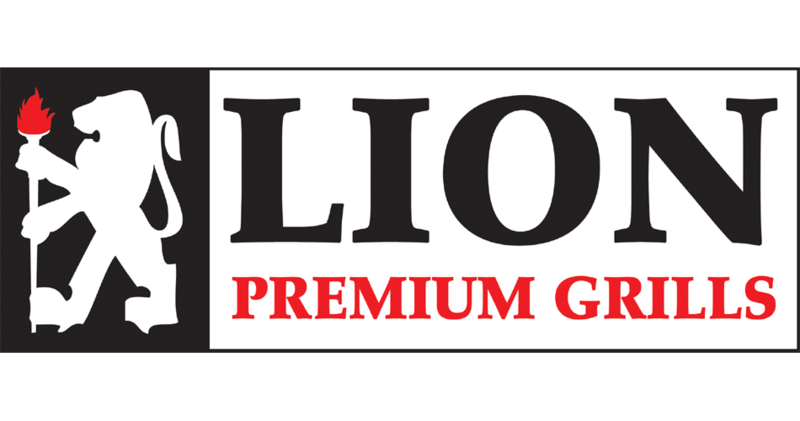 Here’s what we have lined up for this issue of the Lion Newsletter. Kicking things off we have an in-depth feature that breaks down the advantages from using 16 gauge stainless steel which is what we utilize throughout our product line. 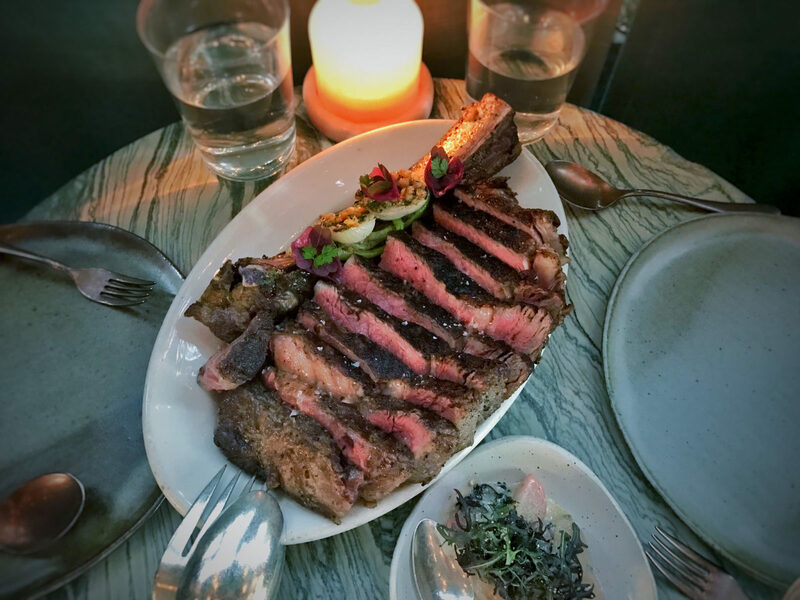 Following that is a recipe for a classic — the grilled bone-in ribeye steak — which is one of our absolute favorites. We also have a feature that goes into detail on how to properly clean and maintain your grill and another that breaks down how you should check your gas connections before firing up your grill after an extended period of non-use. We also have a brief Before and After feature in this issue. We would all like to thank you for taking the time to check out our products — we hope you enjoy! Allow the steaks to come to room temperature for up to 1 hour. Rub the steaks on both sides with the vegetable oil, and season them liberally with Original Essence, kosher salt, and pepper. Preheat the oven to 450 degrees, and preheat a grill, grill pan, or cast-iron skillet to medium-high. Grill the steaks until they are seared on both sides, about 4 minutes per side. Then transfer the steaks to a baking sheet, place it in the oven, and cook until the meat reaches the desired temperature, 140 degrees for medium-rare. Remove the steaks from the oven and let them sit for 5 minutes before slicing and serving. 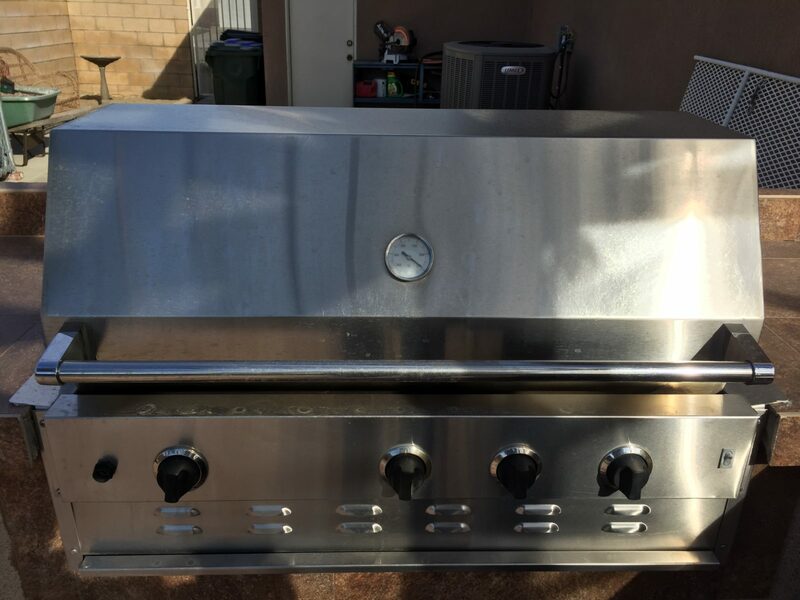 It’s a given that keeping a well maintained gas BBQ grill and cleaning it regularly will keep it in tip top condition for years to come. One of our goals was to also ensure that any type of clean-up, whether it be the grids or the burners, was quick and relatively easy. We would like to provide some quick tips for maintaining a beautiful BBQ grill. Before you start it is ESSENTIAL that you make sure that the fuel line to the grill is disconnected. Please also make sure that any of the control knobs on the grill for any of the individual burners are off! This is EXTREMELY IMPORTANT and must be followed to ensure your safety and security when cleaning any of the grill burners. In this case, accidents can be avoided, just please take the proper precautions. Once this is complete, the process can begin. Remove the cooking grids and extract the burners carefully from the orifice they’re set in. We recommend using a wire brush to clean the burners off. Slosh off all of the caked food matter, oils, grease, etc. that coat the outer layer of the burner with the brush; try to clean up/out any of the flame ports on the burners as some most likely will be clogged which reduces burner performance. If the burner looks to be damaged do not continue to use it; you will need to order a new one. If everything is fine, place the clean burner back into place and re-attach the gas valve orifices. Cleaning the flame tamer is a cinch; it does not need to be cleaned after every usage of the grill, just please regularly check to see if the tamers need to be cleaned. When it’s time to clean, the process is really easy. Remove the cooking grids and take out the flame tamers from their original position. Prepare your wire brush along with a solution made of soup and warm water. Soften the various residue and caked on gunk with the brush; you may scrub vigorously. Once finished, please all the flame tamer to dry completely before placing it back into position in the grill. It is recommended that you clean your cooking grids very regularly; it’s preferential to do so after a few usages of the grill. Make sure that the cooking grids have had time to cool off. Once they have you can gently remove them from the grill itself. You can submerge them in a soap and warm water solution and gently use a warm wash cloth to clean off any particles or residue that remains. 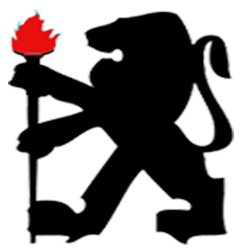 Lion – Before & After! 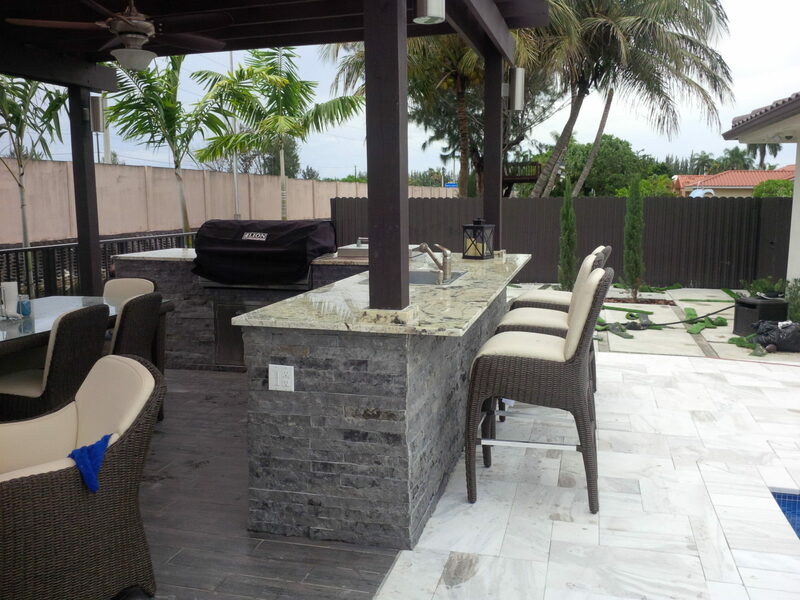 We enjoy showcasing our customer’s backyards after they’ve switched out their old grill with our Lion model. 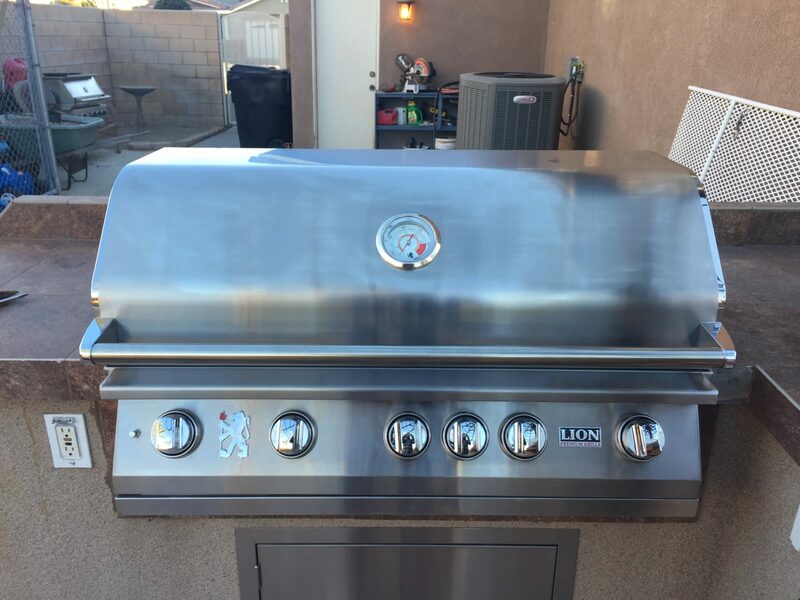 Below you’ll find an example of what we’re talking about; the first image shows the customer’s old grill that while functional looks to be due for a replacement. The design is outdated as you can see; the angular, box-like appearance does not hold a candle to the clean and sleek design of our Lion 40″ 5-burner grill which is in the second picture. 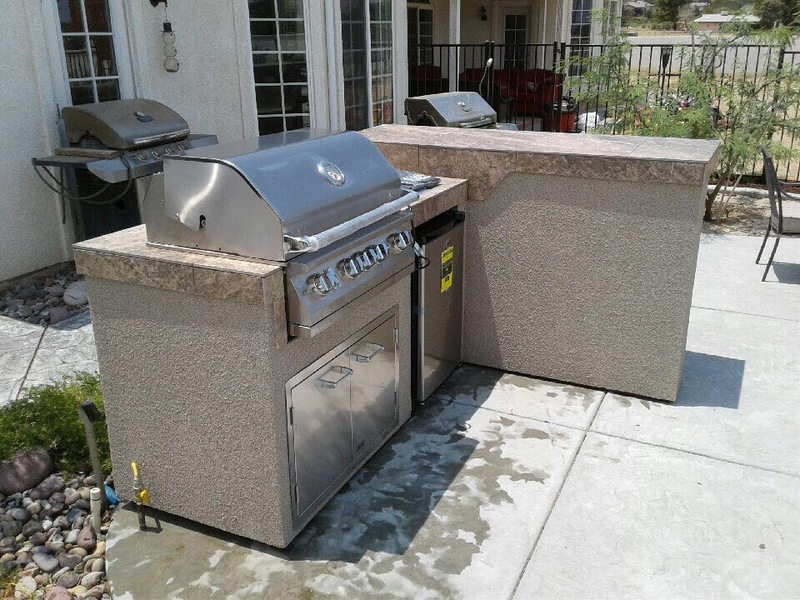 The appearance of our grill as well as the performance vastly outmatches the old model that this customer was using; just the addition of it to this bbq island completely renews the entire visual appearance of the entire unit. This is the customer’s old grill that was being replaced. This is after the addition of our Lion L90000 40″ grill.